This recipe uses raw egg whites that never get cooked in the course of the recipe. Some people don't like to take the risk of eating raw egg, so there is a version of this recipe that uses meringue powder instead of egg white for the same effect. Choose whichever fits your needs. 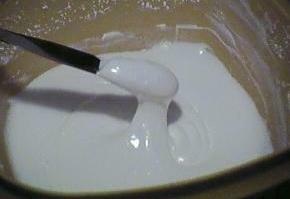 Use a mixer to beat egg whites and cream of tartar until foamy. Reduce mixer speed to low and gradually beat in the confectioners' sugar until blended, then beat on a higher speed until thick and glossy, about 2 minutes. (Add less confectioners' sugar if you don't want it to be too thick; use your judgment. Keep in mind that the thinner you make it, the runnier it will be when heaped on a cake.) Add warm water a tablespoon at a time if the mix is too thick. Use a mixer on medium speed to combine meringue powder with water. Reduce to low and add confectioners' sugar gradually. Then beat at higher speed until thick and smooth, about 5 minutes. Add more warm water, a tablespoon at a time, if the mix is too thick. Use either one as a nice thick icing for a cake!